Several activists on social network sites reported that over 600 units in similar projects in Benghazi were taken over yesterday by protesters that have been waiting for years to move in to their homes. 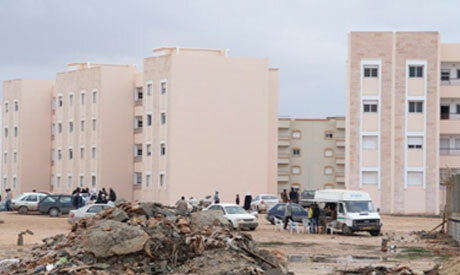 The Libyan government has run subsided housing projects for poor families in several cities for years. However local authorities in some projects postponed the delivery of hundreds of housing units to the owners who have already signed contracts and paid most of the installments. Witnesses said that hundreds of policemen were observing the protests but did not intervene, even when hundreds of people broke in to some buildings under construction. Information and videos posted on Twitter and YouTube show hundreds of Libyans protesting in the east of the country in the cities of Bidaa, Darna and Sabhaa late Saturday. Qourina, an independent news website, reported several lootings during the protests in Darana city. Qourina also reported that two of its reporters were beaten by protesters on Saturday. There are no reports of injuries or clashes with the police. The government response came in a statement on Saturday by the Revolutionary Committee, an influential policy making body within the government, that described the protests as “demagogy” that undermine the legitimate authority. “We have formed a committee to investigate every complaint, all the problems will be solved soon through the legitimate authorities,” the statement added. Libyan state media did not mention the protests; however the Revolutionary Committee's statement condemning the protests was reported on television. Congratulations! Libyan people should fight for freedon and democracy. All corruption and dictators should go down. We all have to follow the example of Egypt that is now free! Go ahead and fight for a new life people! Gaddafi spent the housing scheme money on Uganda's Best Kemigisha of Tooro!!!! People should fight for their rights!!! The voices of those yearning for change is finally out,its roaring like mighty river and shall not be stopped until their voices are had and is heard very clearly for the world is changing and those who are not ready will be changed on by the road side.